ALDI is an unknown for many of us in northern Cal but it’s quickly expanding from the East to the West Coast. They are now introducing a collection of baby items, called Little Journey. 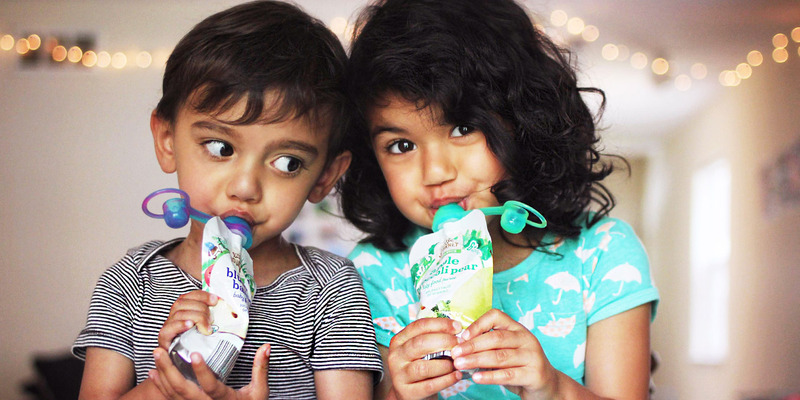 The line features 50 baby products including formula, diapers, training pants, wipes, baby wash, and more… including organic food pouches (as shown above with these adorable faces and our Sipn soft top). Ali Chandra is a mom of two and has been shopping ALDI for years, dating back to her time as an exchange student in Germany. We were eager to hear her parent perspective on their latest Little Journey line. ALDI was founded by Albrecht family, which also owns our California-based shopping pal, Trader Joe’s. The first ALDI store opened in Germany in 1961, with the first U.S. stores opening in 1976. There are now more than 1,500 stores in the United States, and more are coming. The company made its Southern California debut this year. It plans to open 45 California outlets by the end of 2016. Like Trader Joe’s, ALDI focuses on in-house brands. Ninety percent of the merchandise is exclusive to the chain. There are in-house wines, a full line of ALDI-brand gluten-free products and even in-house toilet paper and paper towels. If you are a well-trained Trader Joe’s shopper, the lack of familiar brands won’t come as a shock. But for consumers used to debating the merits of, say, four ranch dressings or 10 iced teas, the streamlined ALDI experience takes some getting used to. And if you have become accustomed to the full-service offerings of Ralphs, Vons, Barons and the like, you might feel a tad deprived. ALDI hopes your wallet will have other ideas. Since making the switch to grocery shopping almost exclusively at ALDI, we’ve cut our family’s grocery budget in half, so when I saw the announcement that they would be rolling out their Little Journey line of baby and toddler products, I wanted to be first in line. We have two kids, an almost-four year old who is fairly convinced that the only veggies worth eating come in pouches and a medically complex two year old who is still recovering from his most recent heart surgeries and needs all the help he can get gaining back the weight he lost. Our favourite part of the Little Journey line is their pouches. All organic fruit and veggie mixes, some with yogurt and quinoa for extra protein, in a huge variety of different combinations for just 79 cents each? I can fill my cart and still come in under budget for the week! My daughter would like you to know that the apple mango one is ‘the most yummiest’ and my son has no comment other than, ‘more!’ We also tried out their yogurt bites and puff snacks and found them to be comparable in taste and texture to Gerber yogurt melts and puffs at a fraction of the price. The puffs and pouches all have no added sugars, and none of their products contain any artificial colors. One thing I was super excited to see was diapers. My son is on multiple diuretic medications to help his heart function, so we go through lots of diapers, and he is the epitome of a heavy wetter. (Seriously; he had a diaper the other morning that weighed over a pound.) The ALDI diapers have held up perfectly to his demands; no leaks or explosions, and he loves the cute lion print on his size. The only thing I miss is the extra spot of velcro that you find on some other brands (such as Huggies Little Movers). My kiddos never stop moving, and I do see some sag in the front after a trip to the park, but it’s not enough to make me want to pay any more for that little grip strip. The Little Journey baby wash has also been a hit and truly is tear free. Their wipes are thick and quilted, strong enough to hold up to the usual messes as well as all the other things we use wipes for, because let’s get real here; I’m not the only one who uses them to clean marker off walls, wipe down restaurant tables, or clean messy toddler faces, right? The bottom line? We are huge fans of the ALDI Little Journey line. Target is going to be seeing a lot less of me, my bank account will be thanking me, and my shopping trips just got even more streamlined.